Recently I came across a link that someone shared for this story about the “Key Kitty” which is a cute little kitty shaped keychain that is also a weapon. With all the debate about weapons on Thingiverse, I thought I’d try an experiment. So here’s what I did… using nothing more than the two photos above, I decided to try to clone the design, and create my own with a 3D printer. 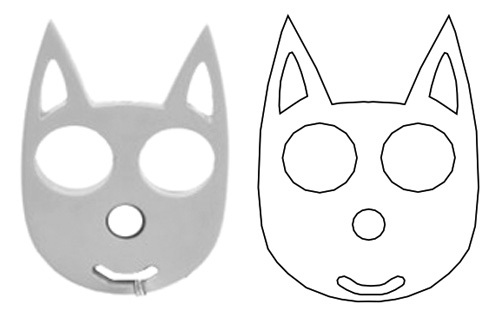 I took the photo of the pink Key Kitty above and created a greyscale version of it, and then imported it into Inkscape. I then traced around it to create a SVG file that approximated the outline. 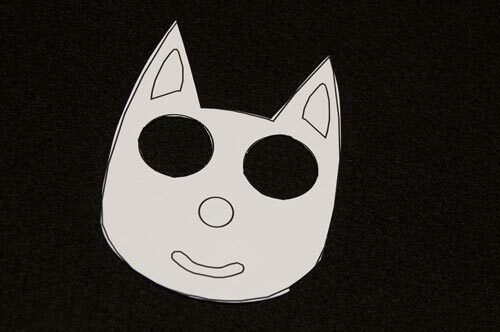 Now, the Key Kitty is a pretty simple object, it’s basically a two dimensional object with some height to it, so the process was fairly easy. At this point I printed out the SVG file at actual size to see how it would fit on my fingers. It didn’t have to exactly match the original, but it did have to fit right. 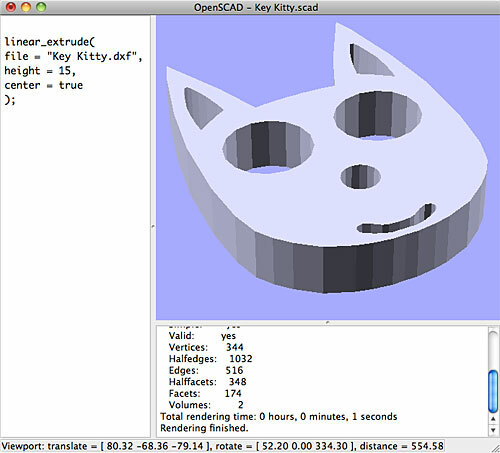 Once I tested the paper prototype and decided it was the correct size, I exported the design to a DXF file and imported it into OpenSCAD and extruded it. So wait, where is the actual print? Well, the night I tried printing it was the night of many woes, and I had two failed attempts at printing it, and with a two hour print time estimate, I ended up not leaving the makerspace with a real printed object. I’m also not 100% sure I should share the files. I mean, there’s the whole issue of the legality of cloning products, and I’m not really sure I want to be a test case on this one. But I figured I couldn’t end this post without a bit more research. I found references to keykittytv.com, but there’s no web site, and it looks like the domain expired back in August 2011. I did find this great Key Kitty video from 2010 though. There’s also a Facebook page and Twitter account, both of which have had no updates for 10 months. For all I know, the company behind this product went bankrupt and closed up shop. Of course this just brings up more questions about cloning it. 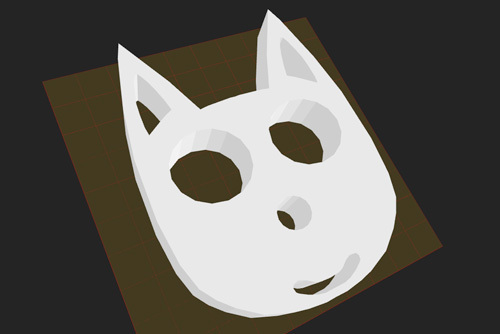 In the end though, I could just make some changes and call it the Key Bat or Key Bunny, or whatever… all it needs are some eye-holes for your fingers, and some pointed ears. So here’s my question to you… What do you think about the cloning of existing products?